Everyone knows that Lent is about sacrifice. So it’s fitting that the first reading in the second Sunday of Lent recalls one of the most famous sacrifices of all time. Here’s the background. Abraham really only desires one thing–a son who will lead to descendants as numerous as the stars of the sky. The only problem is that his wife is barren and advanced in years. So he tries to solve the problem in his own way, and produces a son by a slave girl. This does not prove to work out very well, and both the slave and her son are sent away. Next God intervenes, works a miracle, and causes the elderly Sarah to conceive and bear a son. Isaac, then, is not only the legitimate first-born son of Abraham, but really his last hope. There is absolutely nothing more precious to Abraham than his son. Indeed, to give up his son would be to give up himself. This, by the way, is the true meaning of sacrifice in the ancient world. God deserves everything because he has given us everything. So ancient peoples instinctively knew that authentic sacrifice could never be just a “nod to God.” Rather, it had to be big and precious enough to represent our entire lives. That’s why human sacrifice was so prevalent in ancient times–the offering of the firstborn was seen as the only adequate worship of the gods responsible for our very existence. 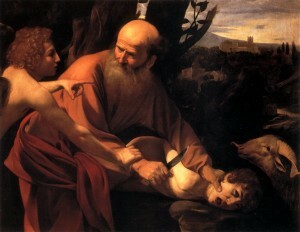 In Genesis 22, God stops Abraham before he slays his son. The ordeal was just a test to see if Abraham was truly devoted to God in faith, obedience, and gratitude. God does not want Isaac’s blood . . . only Abraham’s heart. So he provides a substitute, a ram, which shows the true meaning of all authentic sacrifice–we give to God something precious that represents our very selves. But the image of Isaac carrying the wood for the sacrifice up the slope of Mt. Moriah should tip us off that this story points beyond itself to a future sacrifice beyond all comprehension. The ram caught in the thicket is not the true substitute, and the true sacrifice does not take place upon Moriah. It is the Lamb, not the ram, God’s Son, not Abraham’s, that is offered. Like Isaac, he carried the wood of the sacrifice up the slope of Mt. Calvary. But unlike Isaac, he did so freely, knowing what that sacrifice would cost him. And his sacrifice accomplishes what no animal sacrifice could possibly accomplish–the eternal salvation of all who are willing to accept this free gift of love. For this is what the whole story is about. From Genesis to Revelation, the theme is the astonishing love of God. The love of the Father for his Incarnate Word: “This is my Son, my Beloved” (Mark 9:7). The love of the Father who sacrifices that beloved Son for us (John 3:16). The love of the Son who leaves behind the brilliant cloud of Mt. Tabor for the agony of Calvary. Though it is we who owe everything to God, it is He who sacrifices everything for us. Our love for Him can only be a faint echo of His unstoppable love for us. “Is it possible that he who did not spare his own Son but handed him over for the sake of us all will not grant us all things besides?” (Rom 8:32).